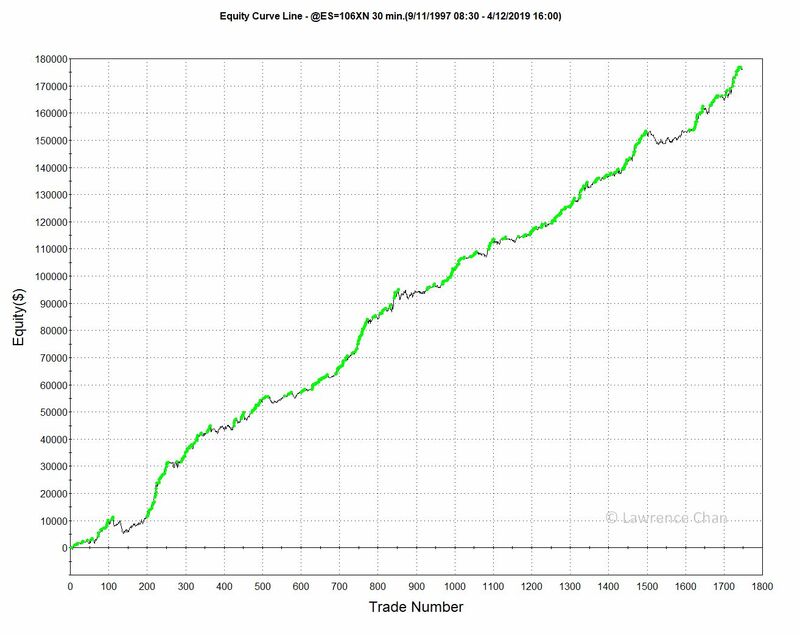 Big-Game Hunter ES is a day trading strategy designed to capture significant intraday moves during normal trading hours. Its balanced approach to trade in both directions allows the system to work well in bullish and bearish market conditions. Based on micro structure in intraday price movements, Big-Game Hunter ES manages to control its risk while maintaining consistency in long term performance. 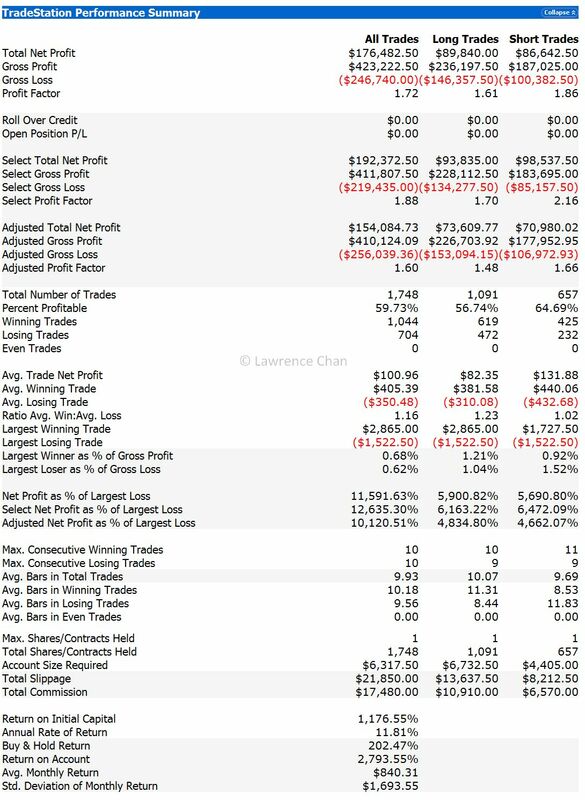 All performance results below are based on trading a single contract of E-Mini S&P, with $10 round turn commission and 1 tick slippage. Following is the profit curve line for Big-Game Hunter ES from Sep 1997 to Apr 2019. As a summary, Big-Game Hunter ES manages to produce more than $8,000 annually after commission and slippage. Using the recommended capital of $15,000 to trade one contract, it is the equivalent of 54% yearly return. Full historical performance report (as of April 12, 2019) is now available for download. The report is in TradeStation mht format. Sign up now to gain access to the report. 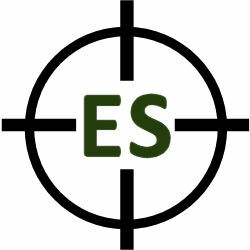 April 2019: We are in the process of setting up a reference trading account with Striker to trade Big-Game Hunter ES. Once it is done, we will have actual results posted here. Market biases on intraday basis, especially in the stock market indices, have been there ever since the beginning of index future trading. Mr. Chan has demonstrated this over and over again in his writings and real-time commentaries. Knowing the existence of such biases is one thing, being able to translate that into functional trading strategies takes a higher level of expertise in trading. Fun Fact: Even though many hedge funds and quant funds have the resources and brilliant minds in data-mining, their narrow focus on specific risk reward requirement that appeal to their investors make them never looking into many classes of market biases that are readily available for us to take advantage of. In fact, their narrow focus helps re-enforce the type of biases exploited by Big-Game Hunter ES. Big-Game Hunter ES is designed to work in cooperation with our other automated day trading strategies to maximize return on the same capital following Mr. Chan’s mindful design principle. Depending on your personal preference, you can mix and match a combination of these strategies to achieve the ideal investment approach. The monthly subscription rate for Big-Game Hunter ES is USD $125 per contract. The rate is approximately 20% of the expected profit, the norm for the hedge fund industry. The algorithm behind Big-Game Hunter ES is our proprietary trade secret. The exact logic and rules will not be disclosed to our subscribers or anyone else. If you are looking for fully disclosed trading strategies to learn from or to adopt for your own trading, check out our trading courses. We are opening limited number of contracts for subscription. Once the limit is reached, we will no longer accept new subscribers. The limit includes both automated trading through brokerages and leasing by family offices and money managers. The reason for the restriction is simple – Mr. Chan is trading this strategy as part of his portfolio of automated trading in his own fund, thus this is necessary to protect the stability of future performance of the strategy for himself and our subscribers. We have arranged with Striker Securities to setup automated trading of our trading strategies. Unlike a hedge fund for which you must deposit money to the fund with lock-in agreement, we take this approach instead so that you have the flexibility of managing your account the way you see fit. Your futures trading account will be opened under Striker with full control by yourself. Many brokerages also offer automated trading through Striker. Thus you maybe able to auto trade our trading strategies through your existing broker. Contact us through email for more details. For organizations interested in trading Big-Game Hunter ES in-house using your own platform and brokerage, please contact us directly with specifics so that we can determine if we are interested in working with you. Serious inquiry only.